I spend a lot of time on my iOS devices. As such I want to stay connected to all my friends and family via IM. So I need an IM program, but I have some requirements. I have a number of different usernames I go by across different IM platforms – AIM, GTalk, Facebook, and Skype. I need something native for both the iPhone and the iPad. I’m also not always going to have my IM program online at all times, so I’d need something that can handle that when I’m not running the program. Luckily IM+ Pro allows for all of this. I started using IM+ Pro from Shape Services a long time ago when they first released it. Back then Apple didn’t allow multitasking, and IM+ did a neat work around using email to allow the server to push notifications to your phone. But that was then. Now with the notifications center and multitasking it’s better than ever. I use IM+ every day now that I am relying less and less on traditional computers. The ability to always be available via IM is a handy feature. Especially when traveling or on vacation (if you want to be available that is) this is useful as IM+ works over your standard data connection. The ad-supported version isn’t too intrusive. It’s even available for non-iOS devices (pretty much any mobile platform out there). IM+ allows you to sign into multiple message systems in one integrated program. That means if you want to message someone on AIM, while keeping a conversation going on Facebook, and pick up your Skype conversation, you can do so, all from within the same window. If you’ve ever used a muti-system messaging system (ie. Adium, Pidgin, Meebo, Trillian) you have the baseline here. The first thing when you load this up will be to set up your accounts. Chances are if you have a message account online, IM+ has it covered. Set up just requires choosing your service, entering in your user name and password, and you are done. Once set up, you can choose which accounts you’d like to auto-login, set to offline, and as well as a few message service specific features. Skype – Voicemail, audio recording messages (since IM+ doesn’t do video/audio chats), and ability to show earlier messages from the Skype chat history. Have multiple accounts you want to use in the same messaging platform? No problem. Just add another account with the same service and continue as normal. IM+ doesn’t limit you to just one account per service. Ok, you have it set up. Now what? You will first be dropped into the standard list view. Your layout will vary depending on which device your on, but they all have some similarities. On the iPhone you’ll start only seeing your buddy list, while the iPad takes advantage of the space by showing that list to the left. The iPhone has the inbox as separate tab at the bottom, while the iPad has it replace your buddy list by the click of a button. The iPad version in my opinion is superior, just do the advantage of space it has. All the options are located up along the top right. Group Chat, Accounts, Status, Settings, and Browser all are one finger press away. And yes you read that right. Browser. Any link you select can be opened directly within the app, without having to go to safari. But if you’d like to use safari, all you have to do is click a button and that page opens up in safari without you having to type anything. The iPad version also has different layouts based on orientation. When turned vertically, the contact list disappears up to a button in the upper left corner. clicking brings down a pop-up window. The iPhone is still good, but suffers the drawback of having a much smaller screen. All of the extra options (other than status) are moved into the “More” tab. Although necessary it definitely takes away from the experience having to flip back and forth between screens. The iPhone does have one advantage that the iPad version doesn’t have. There is a favorite section. This allows you to star contacts that you converse with regularly without having to scroll through your long list of contacts to find if they are even online. The iPhone also is orientation aware, but unlike its larger version, all it does is turn everything 90 degrees. Both version also have tons of color options. You can set the background to one of the presets, or one of your own images. You control how opaque that image is in the background and if you want the theme to be black (my favorite), white or “bubbles” (which is the white theme with the bubbles background). You’ve gotten the lay of the land and now want to really start using this thing… so now what? Well time to start chatting obviously. 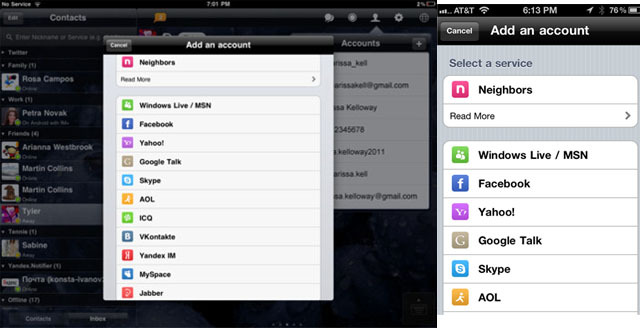 Selecting any of your contacts will open a new window for chatting. Personally I prefer horizontal layout as it gives me a larger keyboard, although vertical layouts do allow (especially on the iPhone) the ability to see more of the chat. To move between chats you swipe the screen left or right. The dots toward the bottom of the chat window indicate how many message windows you have running. On the iPad there is an indicator in the upper left showing how many new messages you have. Clicking on it will show a preview and clicking again will bring you directly to that chat. On the iPhone that indicator is down on the Inbox icon, and clicking it just brings you to a list view showing all available chats. Send location – the program will grab your devices Geo tag (either by the built in GPS or wi-fi triangulation) and uploaded it to a webpage it will link to. Send Voice Message – Not just limited to text, you can record and send via the same IM services a short voicemail type message. User on the other end just clicks the web link the program creates. Send Photo – this again uses a link system to send photos. On the iPad you are limited to your photo library while the iPhone can also take a new picture. Send Video Message – Same as above, but only available to the iPhone version. Send History to Email – This will allow you send the entire currently displayed history to an email address. Some other services also allow for extra features (such as voicemail for Skype), but none support full video or audio chat. Not that you can’t have some “enhanced” chats. Built-in is the ability to do group chats (on supported services). You select what service you want to do a group chat, then select the participants (you can add more later if you want). Once in the chat, you message like you normally do. Once you leave you’ll need to be invited back in. One special message service that IM+ offers is “Neighborhood”. Unfortunately I’ve never really been able to use this as I live in a sleepy little town, and the closest person is way down in the city. The idea is that you don’t need to know people’s screen names or handles to talk to them. 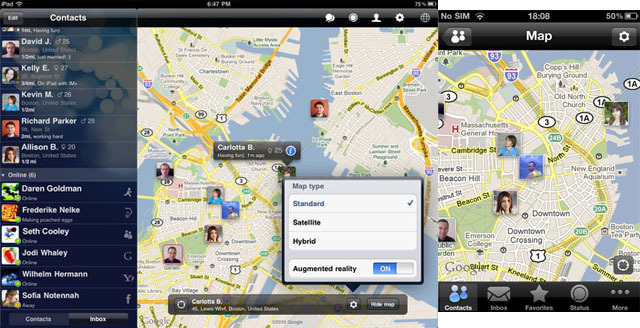 This will show you a map or list of all the people who are nearby your area. Clicking on them will allow you to chat like a normal messaging program. The concept is fully explained over at Shape Services Neighborhood page, but I’ll sum it up. The idea is to have a local chat. Having a yard sale? Make that our status. Looking for a restaurant? Ask. Want to talk about the recent game? Chat away. New to town and want to meet people? Here’s a bunch of people who might share common interests (after all you are using the same program…). Very interesting concept but, as IM+ shows with the sheer different messaging platforms it supports, the message system is already saturated and this service really requires a certain threshold of users to take advantage of it. Perhaps in the west coast where people tend to be more tech savvy, this sees more use, but up here in the North east, the closest person is more than 30 miles away. Not very useful to talk about the town football game or finding a good restaurant. It’s not all rainbows and puppy dog tails though. Since I’ve been using this since it has come out, I’ve had a lot of time to figure out things that I’d love to see added. Combined contacts. Not sure how I’d make this work, but it’s the Number 1 feature I miss from Aduim. Having someone show up multiple times in my contact list gets a bit annoying and even with the icon showing what service I’m using, I still seem to mess it up. Heck i even have some people who I have multiple accounts for the same service that I’d love to combine into one “super” contact. Video and audio chat integration would be nice. And if Apple ever releases the FaceTime protocol maybe add that service too. 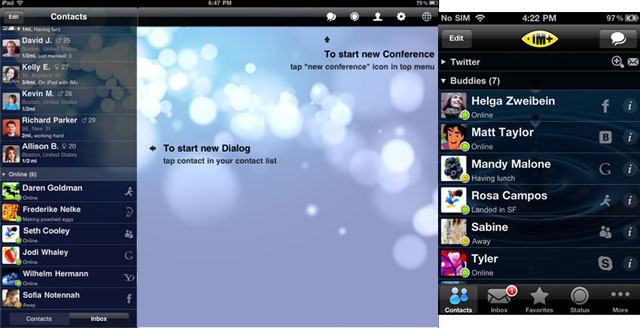 It already supports many message platforms that uses audio/video (Skype, Facebook, Google Talk, MSN, AIM….). Not sure what’s preventing them from implementing this. Having some way to accept file transfers from other programs and save to drop box or some other saved space would be nice. Too often I still have to fire up my IM client on my computer in order to accept a file transfer. Kinda a nuisance. Having the option to save a theme might be nice. It has the possibility I’d think since it has the default “Bubbles” theme, but there’s no way to save a few of your favorite configurations. The other missing feature is no idle message. Understandable with the “always on” feature using multi-tasking, but it would be nice for it to be able to change your message to some sort of auto response after not launching the program after a while. With the ability for it to stay connected for up to a week, it’d be all to easy for people to think your online and just ignoring them. If you find yourself more and more on your portable devices and have a need to keep connected to all your multiple mobile platforms, then yes. Especially yes, since you can try it out for free first (so long as you can handle a few ads). If you are looking for a mobile version of Adium on your computer, this is pretty close. This is a full featured program. With multiple platform support and very good styled look without getting in the way, this is way better than hopping between 7 different apps trying to keep up conversations with all of them. Well worth the free ad-supported version, and still a very great deal at $9.99. Categories: App ReviewTags: AIM, AOL, Apps, Facebook, Google Talk, GTalk, ICQ, IM Plus, IM Plus Pro, IM+, IM+ Pro, iOS, iPad, iPhone, iPod Touch, Jabber, MSN, Neighbors, Skype, twitter, Windows Live, Yahoo!